We are still managing to pull temps of 21C here 10 days off Winter, which isn't too shabby. It's still lovely at the beach, but at this time of year I need to sit in the full sun to feel warm. Usually in high Summer I don't do anything unless it's in the full shade, but at this time of year, it's just lovely under the Australian sun. 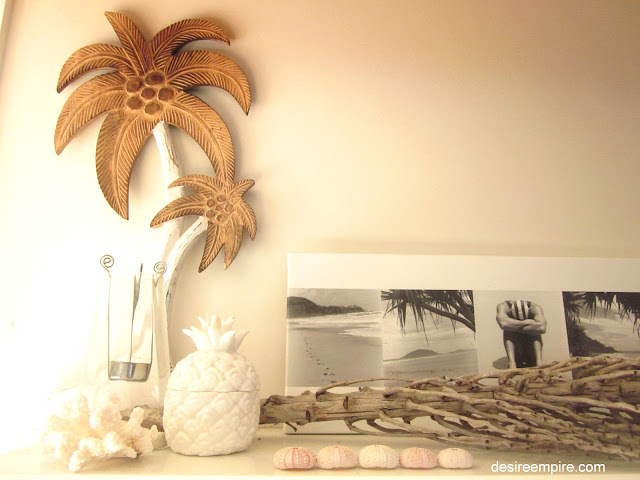 This little Beach House has a Summer theme all year round but I've been changing things around a bit lately. It was getting cluttered in here and I've just mixed things up for a cleaner look. 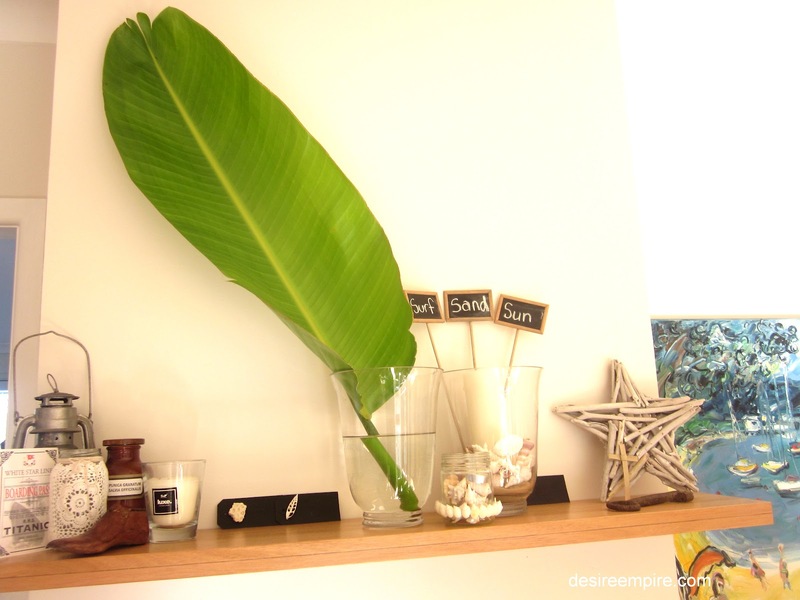 The banana leaf is a feature on my mantel right now. I just love the statement a beautiful piece of greenery can make to a room. I often use large leaves in my decorating because it's sometimes all I have in my garden and they last longer than cut blooms. 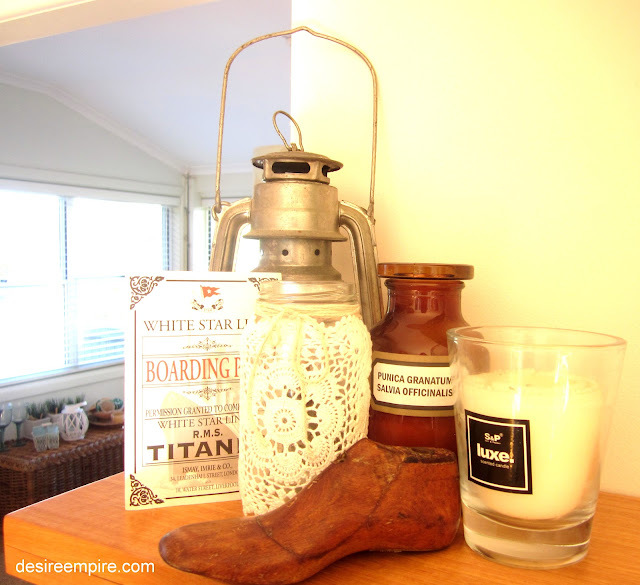 Juxtaposed against the clean coastal lines, I often have a little French themed vintage going on too. It's a more cluttered look but is very textural and earthy. I really adore having pieces from nature in my collections and as much as I like white, I so like it against the greys of nature. 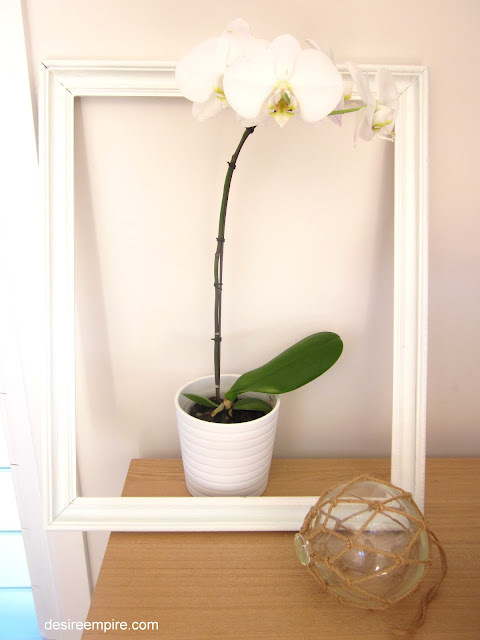 Something as beautiful and simple as a Chinese orchid poking out through a shabby frame can be very effective. 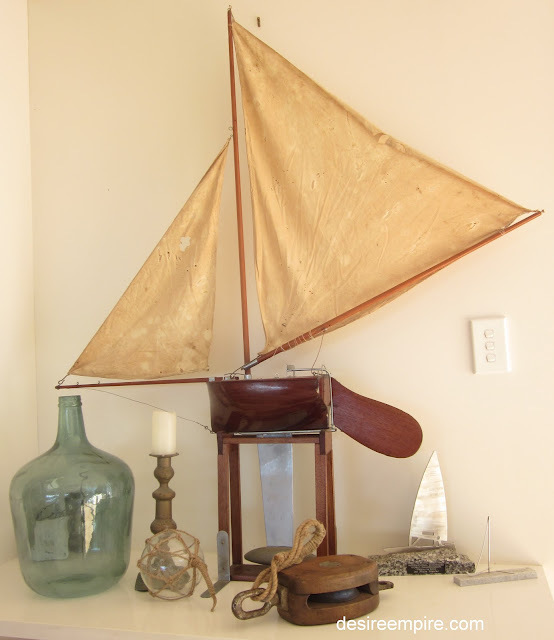 And for a more masculine look, which I also adore, I think a cluster of vintage nautical is swoonworthy. 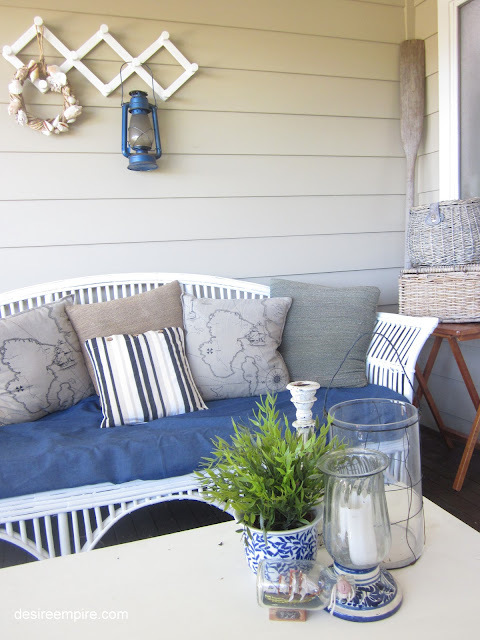 Oh and just a simple shot of my latest porch makeover. The foam came with a blue cover, which I have kept due to the state of the Beach House finances and I have to say the black and blue combo out here is growing on me. Thanks for all your lovely comments on my last post, after my momentary meltdown. Mr Beach House and I are happily on speaking terms again. Can you believe the big Beach House Brat told him he should be nicer to me and that's what prompted the movie offer. At least he does try!!!!! I think I am bringing up a great husband for someone in the future. If only I could teach him to pick up his stuff, she would be a very lucky girl indeed. Hi, Carolyn! I've missed you!!! Great to hear you're enjoying the current weather conditions there! We're gearing up for some VERY hot weather over the next few days. The air conditioner will be humming 24/7!!! All of these are great vignettes! Each one tells a different story. 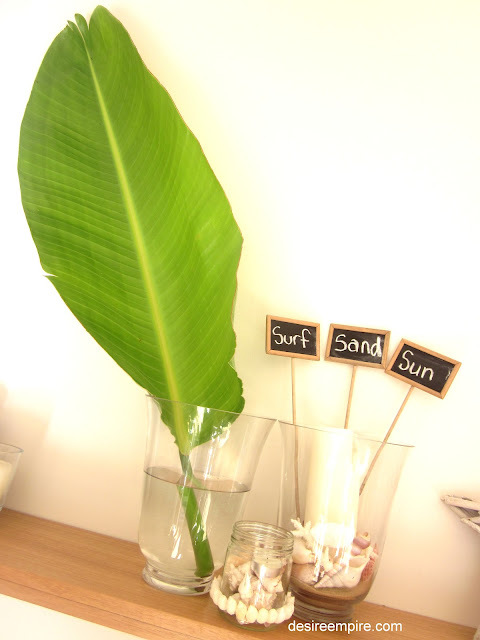 I love the look of the sleek banana leaf! I agree: very chic, and lasts longer than cut blooms. You have a lot of very cool beach-themed items!!! Wonderful!!! Have a great week!!!!!! And having a son is really a blessing. I love that color blue. The color of summer is abound. I enjoyed your blog so much I became a follower. Come and see me if you get a chance. I love your ideas and your blog.Have a great week! 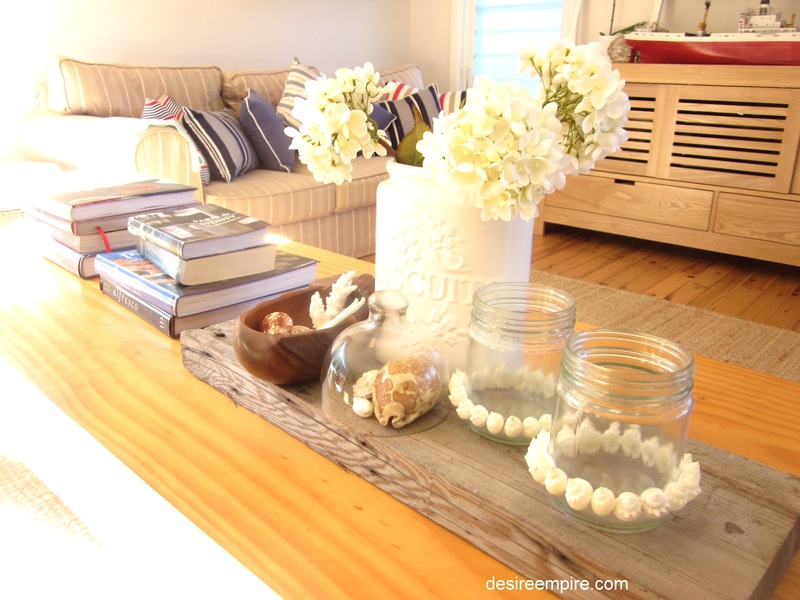 Gorgeous ideas, I love the drift wood/ branch! The simple things/ nature often make all the difference and they are free. Wow, these are gorgeous, though I'm not sure they'd last long in our place! The orchid in the frame is divine, and so clever. Wow, stunning. I'm jelous. I wish I had household creativity like yourself. Love the orchid in the frame! Always look forward seeing your beautiful photos and decorating ideas. I'm with Kate...I love that Chinese orchid in the frame. Love how it feels beachy but not corny, if ya know what I mean? Your breezy whites are lovely! I love those map pillows! Thank you for sharing and participation in the party http://www.finecraftguild.com/party/ . We'll feature a few people and have a new party tomorrow.